Perhaps a variation of squash may be on the table this Thanksgiving as we pick out the entirety of favorite dishes that will decorate the table that our families will gather round. And yes, the selection process is a big part of the Thanksgiving meal. But, we parents don’t get to pick whom our children will marry and yes, we don’t even get to pick out whom their best friend will be, but in the case of Sophie’s parents, they are confronted with a… but let me hold out for a bit here…a SQUASH for a best friend! Count yourselves among the lucky ones, folks. Art Linkletter had a show called “Kids Say the Darndest Things” eons ago where kids would embarrass their parents with seemingly innocent and innocuous observations as kindly Art acted as inquisitor. Oh, some of those things made the parents want to disappear to Oz! But if those parents could survive, can Sophie’s parents withstand a stop at the farmer’s market that culminates in Sophie’s picking out a new and peculiar play pal she names Bernice. Yup, she’s a SQUASH all right! But I have to say up front that there is something particularly endearing, charming and very human and funny and yes, a bit sad about “Sophie’s Squash”. It is what a kid would take a liking to; – yours, anyone’s or mine. Something that appeals to a child is very hard to figure sometimes. For instance, we parents can sometimes spend exorbitant amounts of money at Hanukkah and Christmas for our young ones’ elaborate gifts and you find them in a corner totally absorbed with a BOX! So it is with Bernice. She’s a squash, but she’s lovable – to Sophie. Sophie takes Bernice everywhere wrapped in a blanket. There are friendly forays to story time at the library and visiting other squash at the market where she was initially “picked” as best friend. Sophie has to let go and finds the perfect spot outside her home for Bernice under a mound where she can be observed closely. The conclusion of the book is handled beautifully and perfectly as Sophie comes to terms with the life cycle of vegetables, and their regenerative powers. 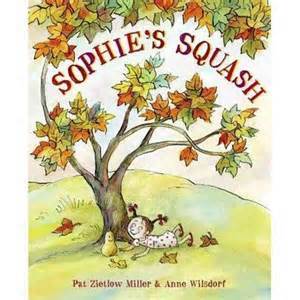 Somehow you get the feeling in this deceptively simple, yet profoundly funny and moving book, that Sophie and your young reader will learn a broader life lesson after reading “Sophie’s Squash.” And Bonnie and Baxter are truly worthy names for Bernice’s progeny!